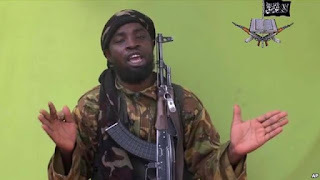 Abubakar Shekau says he is alive and still the leader of Islamist sect Boko Haram, denying reports he is dead, according to a new audio message quoted on social media on Sunday. Reuters could not independently verify the authenticity of the audio message. Social media feed of jihad monitoring site SITE Intelligence quoted a new audio message released from Shekau denying reports that he is unable to serve as leader. There have been several claims by Nigeria's military that Shekau has been killed over the last few years but he keeps resurfacing in new videos or it could be "impostors" posing with the same name, security sources have said. Last week Chad's President Idriss Deby said Boko Haram leader Shekau was wounded and has been replaced as leader by Mahamoud Daoud, adding that Shekau went to Maiduguri, capital of Borno state, after he was wounded. Deby said the new Boko Haram leader, whom little is known about, was open to the idea of talks with Abuja. "Infidel media published that I'm dead, or sick and can't speak, this is an utter lie." Rita Katz, director of SITE Intelligence posted on her social media site quoting Shekau as saying to ISIS leader, Baghdadi. "If this was true how is that I can speak now?" message signed as ISIS head of west Africa province. Shekau's last video appearance was in February, when a person claiming to be him -- analysts believe he may have been impersonated -- threatened to disrupt Nigeria's presidential elections held the following month. The group has released at least five videos since then but Shekau has not appeared in any of them. Suspected members of the militant group Boko Haram have killed more than 600 people in Africa's most populous nation in a spate of bombings and shootings since Buhari was inaugurated as president on May 29, according to a Reuters tally. Efforts to reach an agreement to end the violence, including a 2014 deal fostered by Chad, have repeatedly failed during the six-year insurgency waged by the group in its bid to set up a state in the northeast adhering to strict Islamic laws.